Weak dark matter (DM) self-interactions are a natural and well-motivated possibility, with possible observable consequences for large scale structure and halo dynamics. A minimal type of DM self-interaction is “dark electromagnetism”, which could cause DM to exhibit collisionless plasma-like collective behavior [1, 2]. This possibility raises the question of whether plasma instabilities may have a significant impact on the galaxy and cluster dynamics. Resolving this will determine whether or not such an interaction is consistent with current observations, and whether plasma instabilities may have a significant impact on galactic dynamics. Two-dimensional PIC simulations  were performed using two identical, collisionless e− e+ DM plasma clouds (shown in blue color). 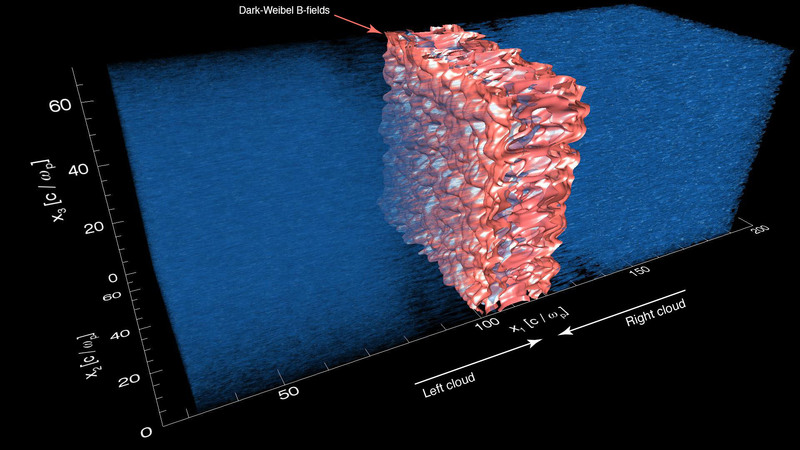 This picture depicts the interaction of two dark e− e+ plasma clouds mimicking the merger of two DM halos, such as in the Bullet Cluster. A transverse Weibel magnetic field (shown in red color) grows during the interactions which deflect the particle trajectories, transferring bulk forward momentum into transverse momentum and thermal velocity spread. This causes the slowdown of the DM plasma flow. In this work, we have shown that if the typical DM slab length L > vfl Δt, this slowdown is always expected. Comparison with astronomical observations reveals strong new constraints on DEM with the dark electromagnetic self-interaction ΔαD < 4 × 10-25. L. Ackerman et al., arXiv:0810.5126 [hep-ph] (2006). For more information, see N. Shukla, K. Schoeffler et al., e- e+ plasma-dark electromagnetism similarity establishes a (nearly) weaker-than-gravity bound on long-range dark matter self-interactions, 60th Annual Meeting of the APS Division of Plasma Physics (2018), more details here.